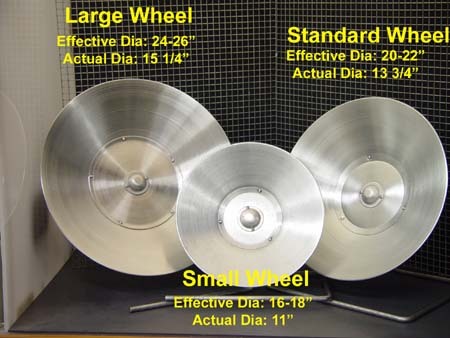 The Flying Saucer Wheel: Why it works, what is does. 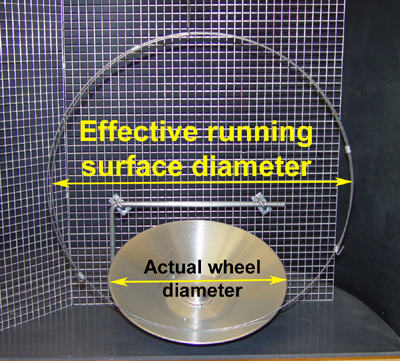 EFFECTIVE DIAMETER vs. ACTUAL DIAMETER: The unique, patented dish design of the Flying Saucer Exercise Steel Wheel produces a running surface with a diameter substantially greater than the actual wheel diameter. This greater 'Effective Diameter' allows animals to use a full length stride and stride at up to 3 full strides per second. Very fast!!! Flying Saucer Wheels mount to the side wall of the cage. Picture at right shows side view of cage wall mounting. General safety: Be sure to allow at least 1 1/2 to 2 inches clearance on either side of and from the front edge of the wheel. All wheels ship with a bearing dust cover. 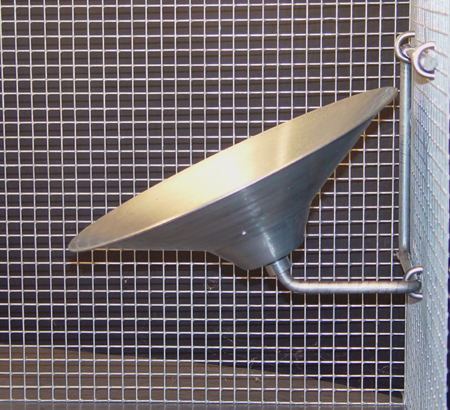 The dust cover protects bearing from dust, moisture and animial urine which prolongs bearing life. 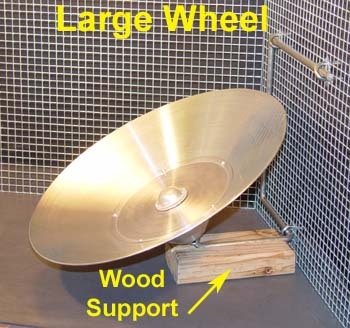 Large Wheel with wood support block: The large wheel extends out farther from the mounting wall than the Standard or Small Wheels. This greater distance can cause vibration (noise) of the cage wall. The wood block provides additional support to the wheel to significantly reduce vibration. The large wheel should be mounted close to the cage floor. The wood block will slide out so slide-out cage bottom trays can be removed for cleaning. For solid wood, plywood or melamine cage walls. 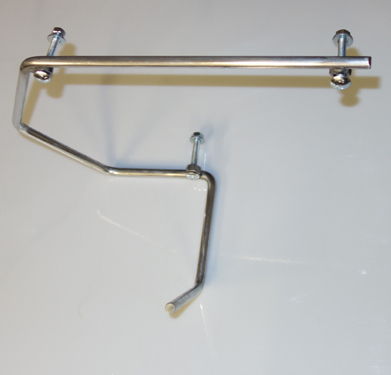 This wheel stand will attach to solid cage walls up to 1 1/4" thick. It is available with all 3 sizes of wheels for an additional $10.00 and for individual order for $20.00. 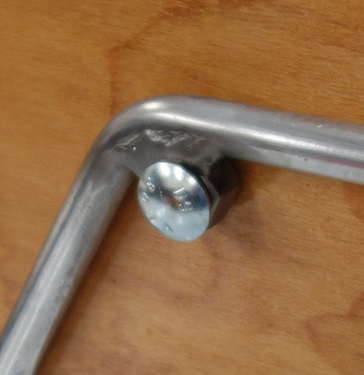 Stand is held in place by 3 carriage bolts which extend through the solid wall. To install, hold the stand in the desired position against the solid wall. Use a pencil to mark the 3 hole positions. Drill 3 x 1/4" holes. Insert the carriage bolts through the nuts welded to the stand and then through the drilled holes. Firmly attach stand to wall by installing the 3 flat washers and the 3 x 1/4" nuts. 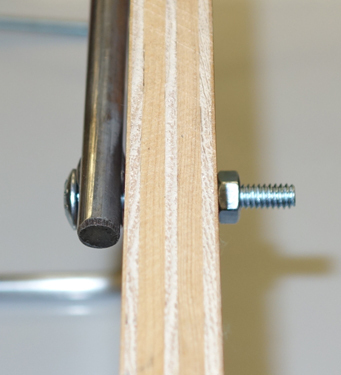 Close up of carriage bolt attaching stand to solid wall. Cutaway view of carriage bolt with nut and flat washer to secure stand. Welding the nuts to the stand burns off the some of the protective zinc coating. There may be some discoloration in the weld areas over time but this will not impact the weld strength or wheel safety. Occasional light scrubbing with steel wool will help remove discoloration. The Flying Saucer Exercise Wheel was invented at Meadowbrook Chinchillas to provide a safe exercise outlet for chinchillas and other small animals. Drum-type wheels must be very large to avoid overarching of the back. Wheels with slats, bars, cross members, spokes, open wire mesh or screen often cause serious injury to animals. Feet, legs or heads may become trapped or snared. This may result in severe injury (amputation) or death of the animal. Since rodents are nocturnal, most injuries will occur at night. If a foot becomes trapped, the animal may chew it of to escape. The Flying Saucer wheel has no openings, slats or sharp edges where injury can occur. And it also really works well for exercise. SAFETY FOR KITS: We recommend removing wheels just prior to an expected delivery date because a adult can generate very high wheel speeds. If a new born kit is exploring the wheel and an adult jumps on and starts it up, the kit may be thrown off and injured. Reintroduce the wheel at about 3 months old. At that point in time, kits have good jumping skills and coordination. The SMALL WHEEL fits animals up to 1 1/2 lbs (degus, sugar gliders, rats, guinea pigs, hedgehogs.) The assembled Small Animal Wheel will fit through a door 6 1/4" x 9" or larger. The STANDARD WHEEL accomodates animals up to 2 1/2 lbs. It is ideal for chinchillas. 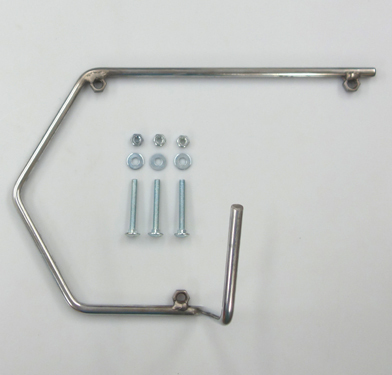 The assembled Standard Wheel will fit through a cage door 9" x 12" or 10" x 10". The LARGE WHEEL comes with a removable wood support block to support heavier animals. For Skunks, opossums, prairie dogs. BENEFITS: Superior respiratory health, cardiovascular conditioning, disease resistance and a lot of enjoyment. We have some extremely well-muscled and firm chinchillas. Chins of Steel!! USE PATTERNS: Adults and weanlings generally alternate using the wheel. One may jump onto the center of the wheel, then slide down and nudge the other chin off. Our pairs trade back and forth. Chins may run in either direction, change direction while on the wheel and will learn to start, stop, mount and dismount the wheel with great expertise. Some seem to enjoy the thrill of suddenly stopping and then ridding the saucer around. CONSTRUCTION: Simple, clean, strong construction using the metal spinning process. The dish is axle-mounted on two flanged ball bearings for stability, durability and quiet operation. 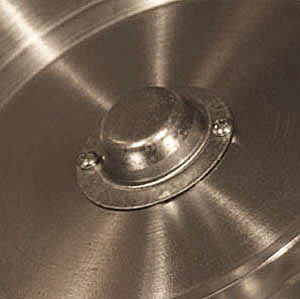 Dishes are constructed of24 ga. galvanized steel. A 3/8" diameter bent steel rod forms the wheel stand used to attach the wheel to the cage wall. Attachment devices and a hex wrench are included. WHEEL CARE: The bearings are durable but are not water proof or dust proof. Do not submerge the wheel in water as this will cause damage to the bearings. Dust bath material is extremely abrasive. Try to keep the dust away from the wheel. Do not give your chins a bath on a cage level above the wheel as dust will fall onto the wheel. Do not use the wheel surface as a dust bath area. The normal amount of dust on a chin following a dust bath will have little effect on the bearings. To clean the wheel, use warm water, wipe with a paper towel or cloth. Dry surface after cleaning.